Our methodology enables the analysis of specific cell populations by quanti-tating the number of binding sites (epitopes or molecules) per cell. 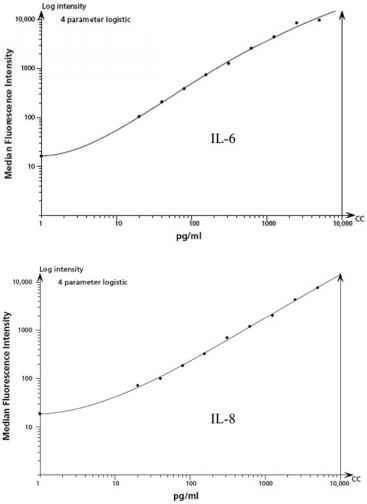 This is achieved by the use of calibrated bead populations that bind a quantifiable amount of antibody (antibody-binding capacity [ABC]), generating a standard curve that converts channels of mean fluorescence intensity into molecular equivalents of soluble fluorochrome. Specifically, we use QuantiBRITE PE beads (BD Biosciences), where each of the four bead populations has a calibrated mean number of bound PE molecules/bead, which establishes a fluorescence standard for each experiment. Samples are stained with antibodies that are conjugated with PE at a 1:1 ratio. The number of bound PE-conjugated antibodies/cell in the sample is extrapolated using PE beads as a standard. Thus, PE molecules bound/cell is equivalent to the number of antibodies bound to the cell. This, in turn, is equi valent to the number of molecules of target protein in each cell.